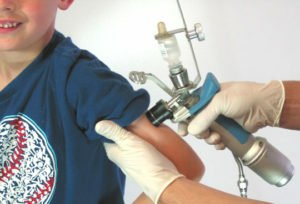 Pulse NeedleFree Systems is developing needle-free injection products to serve the human mass immunization market, primarily large scale vaccination campaigns against vaccine-preventable diseases and to respond to health emergencies such as bio-terrorism attacks or pandemic outbreaks. Pulse’s primary human injection system, the HSI-500, utilizes a proprietary protector cap to serve as a hygienic patient interface. Pulse has achieved U.S. FDA clearance to market the HSI-500 system and is currently conducting additional product development activities and testing prior to commercialization. Pulse’s development program has been sponsored by the Program for Appropriate Technology in Health, through funding from the Bill & Melinda Gates Foundation.